Kolkata: Noting that the state government stands in contempt of an earlier order where the High court had directed that the bond amount, as well as the years of mandated service, shall be decreased for medical practitioners in the state, the Calcutta High Court has recently stayed the compulsory state service bond order in the state. The Calcutta High Court further directed the West Bengal government to inform it of the reasons for its failure to comply with the court order declaring as unconstitutional the three-year compulsory rural postings for post graduate medical students. In addition, the court has barred the government to issue an order until it hears the contempt case filed by 146 postgraduate doctors. The move comes after medical practitioners complained to the the high court about the arbitrary increases in the compulsory state service bond’s amount over the past few years. In 2014, the bond was fixed at Rs 10 lakh. They were required to pay the money if they refused to work in the state for at least a year. In 2015, the bond amount was increased to Rs 20 lakh and the mandatory period of service for postgraduate students to two years and postgraduate diploma students to three years. In 2017, the university increased the bond amount for MD/MS students to Rs 30 lakh and the mandatory service period to three years, while the bond amount of the diploma students remained unchanged but the mandatory service period became five years. Following the 2017 notification, 146 doctors filed a petition, observing which; honourable Justice Mukerji described the notification as unconstitutional. “The bond amount should not exceed Rs 10 lakh and the service period one year,” he stated. Justice Mukerji had passed this order in November last year holding that the state government directive was unconstitutional. However, some of the petitioners moved a contempt petition before the court stating that the Health Department ignored the order and continued with the practise, Pratik Dhar, lawyer for one of the petitioners, said. He further asked the Principal Secretary and the Secretary of the Health Department and the Director of the Health Service to file affidavits within two weeks stating why contempt proceedings should not be drawn against them, reports The Telegraph. The matter has been adjourned till July 28. 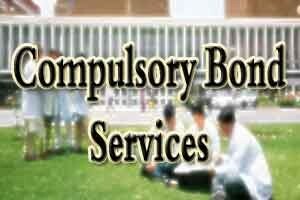 The issue of bond service in the state of regularly bringing the state officials and medical professionals at loggerheads. A few weeks ago, Dr Rahul Bansal, who completed his PG degree from SSKM Hospital, had moved to the Calcutta high court stating that the government is constantly refusing to give him back his documents, even after he had paid the mandated bond penalty. Following the hearing, the Calcutta High Court directed the West Bengal Health department to return original certificates of Dr Bansal.